Gadwin Springer is in Castleford's squad. Picture: Matthew Merrick. GADWIN Springer has been drafted into Castleford’s 19-man squad for Sunday’s home Betfred Super League game against Wigan Warriors. 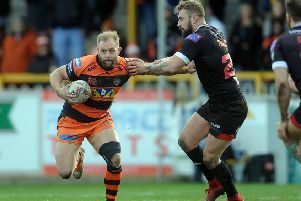 Springer, who replaces suspended Oliver Holmes, could make his first appearance for the Tigers this season. Tigers coach Daryl Powell is relishing Sunday’s game. Tigers playmaker Luke Gale is also looking forward to facing Wigan. Gale said: “Wigan are a good, aggressive side and they are playing well at the moment. Castleford’s squad is James Clare, Matt Cook, Jamie Ellis, Alex Foster, Luke Gale, James Green, Nathan Massey, Mike McMeeken, Paul McShane, Grant Millington, Adam Milner, Greg Minikin, Junior Moors, Ben Roberts, Jesse Sene-Lefao, Michael Shenton, Gadwin Springer, Jake Trueman, Jake Webster.